The dating app landscape is littered with creative, crazy, and creepy ideas: apps that connect your LinkedIn profile; apps that suss out your favorite ethnic fetish; and Farmers Only. That last one's brilliant. 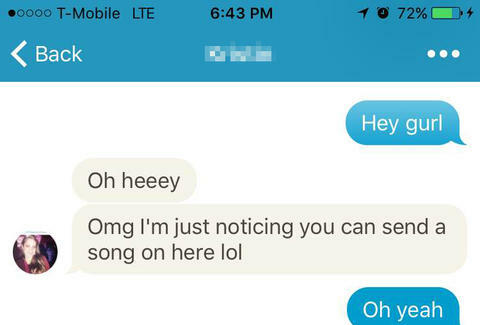 In the debatable category: Happn, which now lets its users send each other voice messages through its interface. If you're unfamiliar with Happn, the app works kinda like Tinder, in that you get to right- or left-swipe potential matches. But your pool of potential matches draws from your physical surroundings, as Happn searches within a 250m radius and shows who you've most recently crossed paths with in real life. It's brilliant in a way, in that you'll see people in your immediate vicinity. It's also creepy AF in some ways, as you'll see everyone who's single (or not, but looking!) near your apartment, every time you're at home. Same goes for at the office. In any case, the newest addition is pretty creepy. When's the last time you left anyone a non-work- or bill-related voice message? "This new voice feature provides our members with another opportunity to connect on a more personal level and create meaningful relationships," Happn cofounder and CEO Didier Rappaport said in a statement, according to Business Insider. Now, it's not just a dirty-talk free-for-all over at Happn. Nah, you've gotta match with somebody first, which Happn calls a "crush." Then you can click on a little mic icon and send away your sweet nothings. Or your sweet somethings. Or your umami nothings. It's really your choice of what to say. But the clip can last up to a minute -- surely punctuated by plenty of impressive "Uhh..." sounds and "soo... it's 7:15 and I was just wondering if you wanted to maybe get a drink" types of rock-solid icebreakers. Fortunately, all users retain the option of deleting a crush, so if somebody's got an awful phone voice... as Hawk Harrelson would say... HE GONE. Check out Happn's latest feature on iOS or Android devices, or in your local grocer's freezer. Oh, no, that last one's about Drumsticks. Ryan Craggs is Thrillist's Senior News Editor. He has used Happn and gone out with handful of girls from the app. It went OK. Follow him @ryanrcraggs.